MONTREAL (AP)	-- Nineteen-year-old Rafael Nadal won on a hardcourt for the first time, beating 35-year-old Andre Agassi 6-3, 4-6, 6-2 in the Rogers Cup final Sunday. The French Open champ's left-handed shotmaking got the better of Agassi, who was missing the lines with his winners in a baseline battle interrupted 58 minutes after the first set by rain. 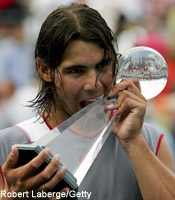 It was the top-seeded Spaniard's third victory in a row and his ATP-tour-leading ninth tournament win of the year. His eight previous wins, including the French Open, were on slower clay courts. Nadal, who has a 16-match winning streak, won $400,000 while Agassi pocketed $200,000. Fourth-seeded Agassi, who was coming off a win in Los Angeles two weeks ago, ended a 10-match winning streak. It was the first meeting between Nadal, considered the sport's next superstar, and Agassi, who has won 60 tournaments, including eight grand slams and three wins in the Canadian event, in his 19-year career. The two had some spectacular rallies, with Nadal repeatedly running down crosscourt shots that looked impossible to reach. Nadal had lost only one of 53 service games in the tournament going into the final, and held nine more times before Agassi broke his but precisely placed serve in the final game of the second set. But Nadal didn't collapse, breaking a faltering Agassi for 2-1 and 4-1 leads in the final set. The 16-year age gap between finalists was the largest on the ATP tour since 1979, when 35-year-old Tom Okker beat 19-year-old Per Hjertquist in Tel Aviv. Nadal, coming off wins at Bastad and Stuttgart, has not lost since falling to Gilles Muller of France in the second round at Wimbledon. It was Nadal's fourth final of the year in a Masters Series event -- the nine tournaments ranked just below grand slams in prize money and importance -- and his third win. It was the first time Agassi has lost after reaching a Masters Series final since Miami in 1998, ending an eight-match winning run. Nadal's tour-leading 65 match wins this year is second best ever by a teenager to Boris Becker's 69 in 1986. The last teenager to win the Canadian tournament was Michael Chang in 1990, when he was 18. Agassi's last loss to a teenager in a final was in 1990, when he was beaten by a 19-year-old Pete Sampras. And Nadal has the most wins by a teenager since Agassi won 63 in 1988. His ninth tournament victory tied Mats Wilander in 1983 as the most by a player under 20. The win should be a major confidence-booster for Nadal going into the U.S. Open on hardcourts at the end of August.